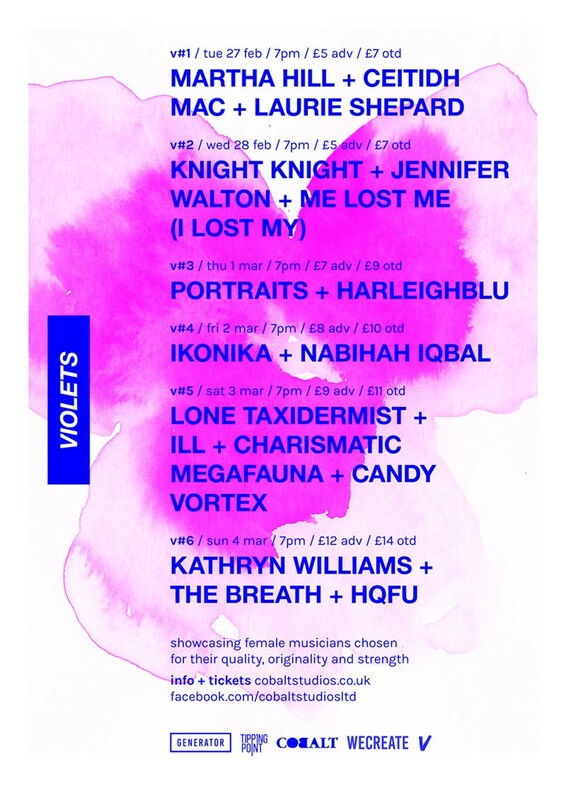 The WeCreate project launch will be a series of female led gigs at Cobalt Studio's Violets programme from Feb 27th – March 4th 2018. Violets is a whole week of music made by talented women. It presents emerging and established artists chosen for their quality and strength in their field – from club nights to cabaret to straight up gigs travelling across a range and breadth of female creativity, diversity and musical genres – each night is distinctly different. Music is a key focus but many of the acts selected also combine theatrical, visual and performance elements in their work. The program will also consist of performance, panel discussions and smaller group workshop opportunities. Through the WeCreate project and partnership with Cobalt, this is the launch of a public intent to ensure that the program is well balanced and addresses gender inequality in the music industry. Despite such a rich variety of feisty, colorful, talented women in music, the scales are still very unbalanced. This is no bandwagon statement; the statistics are there to prove it.